We created a bird study for Miss J. I decided it would be good to share some of the book resources with you that we used. I will be linking to this in an upcoming post on the unit study itself so be watching for it. We specifically made it a point to talk about John James Audubon and the influence he had on nature studies, and bird studies in particular. These were two very interesting books about him and his work. These are some of the reference books we picked up at the library. These books were chosen because they hit on a specific theme or idea we were covering such as nests or the birds we were likely to see based on where we live. And these were directing some of the more detailed information and questions for the study. These books, by themselves, make a pretty thorough bird study. But, if you want to go further with it, check out the upcoming post about the unit study that Miss J just finished. Soon, I will be sharing with you a review of this new book from Bonnie Rose Hudson. She is an amazing writer whose works show us new worlds and lead us to experience people and places we didn’t know about before. The Hidden Village is just such a book. In fact, it is about that very thing. I have pulled these videos together to share with the giggly girls in order to enrich our own reading of the book and to help us understand more about the place and culture of the story and its characters. The book is set in India, in the part that is known as the state of West Bengal. The village is situated at the southern end of this section, near the Bay of Bengal. Just a few videos to pick and choose from about mangroves. The place where the story takes places is a mangrove forest and that is very different than any forest my girls have ever seen. So I found a few and we probably will not watch all of them all the way through. But, I did like certain things about each one so I chose a variety. In the book, the family cultivates and harvests jute. So, what better way to understand the work that goes into the harvest of this product than a couple of videos. The character talks about visiting the market and what they are able to get from the markets. I imagine this one is still very different from what they experienced in the book but it still gives a bit of an idea to the girls. I found this interesting. It would be more like the village the main character lives in and not the village that was hidden. Still, some pictures are helpful in understanding more about them, even if it is not as primitive as the book setting. A sari is a style of dress that is worn long and over one shoulder. These are often colorful and vibrant. The best way to see a sari is to do a search online. Many of what I found were very fancy, not at all what I would imagine the girls and women of The Hidden Village would wear. You can read up on this magnificent animal and see some images pretty easily online. Here is a nice information page about it that gives very readable information on the rhinoceros, an endangered animal. This herbivore can grow very large and is a solitary animal. This little mammal is very small, only about 6 or so inches. It eats both plants and animals, making it an omnivore. They appear much like a weasel but are very agile like a monkey. There are a few images on A-Z Animals and there are plenty of others online. And that is the end of the list. There are probably more that I could pull together and I might. But for not, these are the ones that are specifically mentioned at the end of the book in the section on exploring the world of West Bengal, India. We have had a lot of fun recently using a weekly science lesson from a company called Mystery Doug. Each week we get an email with a link to a video answering a question. We watch the video and then, if even one of the girls is interested in learning more, we do the extension activities when they are offered. This week the question was about the skeleton – why do our skeletons have so many bones? The short, five minute video was a neat illustration of the human skeleton and its function. It doesn’t take long for the video and we have really learned a lot of interesting things from these videos. Sometimes, there is an accompanying hands-on activity. This week, it was making an artistic rendition of your own hand so that it looks like an x-ray. It was lots of fun and Miss J did a great job with hers. We have found that the video do so well that the topics pop up in conversations often. For example, the other night, we were talking with grandparents about the trees changing colors. Miss J popped out the explanation for the change in colors and shocked everyone at the table (the other two girls had missed that particular video lesson). She was quite proud of the fact that she knew something no one else did. Great way to increase self-esteem, as well. If you are looking for a short and simple addition of science to your week, check out Mystery Doug. 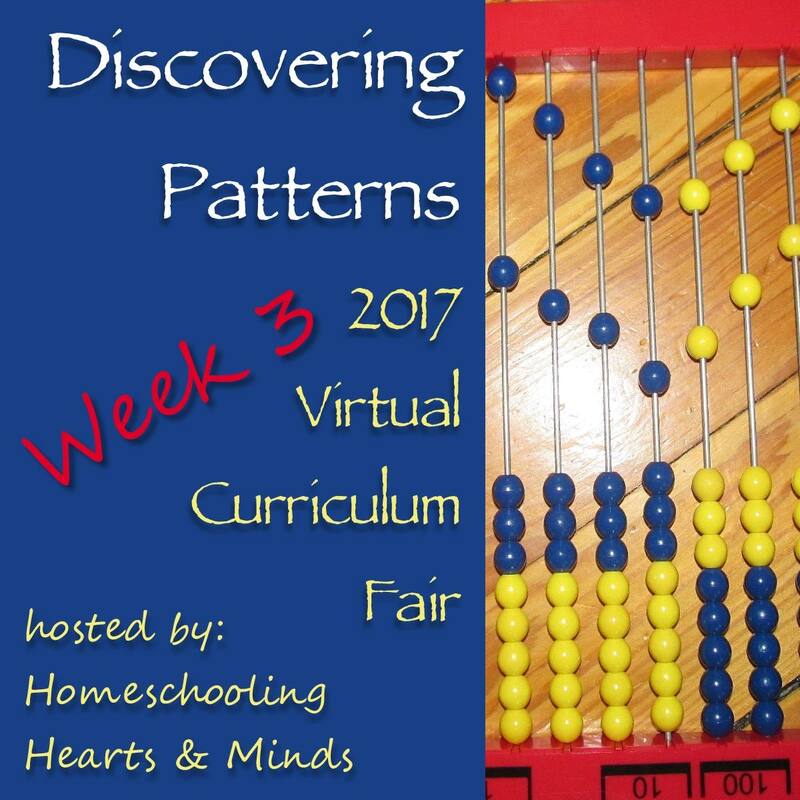 This week, the Virtual Curriculum Fair is focusing on Discovering Patterns: Math and the Mathematical Sciences. You will find all sorts of ideas, helps, and surprises for practical math applications among the posts. It is no secret that math is the hardest subject for me to write about. I could whine and complain but really, it amounts to an insecurity within myself. I know and recognize that and I fight it all the time, hoping my girls will learn to be confident in their math abilities. We have struggled with finding a good curriculum, even with our adventures as part of the Homeschool Review Crew. We have found several tidbits that help us. 1 – We do not do well with an online curriculum. Examples might be Teaching Textbooks or Khan Academy or A+ Interactive Math. We realize that these have many wonderful features; they just don’t fit our children. And that is okay. 2 – We have realized that the girls need to be able to ask questions of a real person and get multiple explanations of a concept. These explanations need to be different each time, using different words to help get the concept across. 3 – We need to practice a few problems at a time and not be overwhelmed by a huge page full of the exact same type of problem x 100. 4 – But we can do several different concepts on each page, as long as there are 5 or 6 of each type. 5 – Color is helpful and brightens up the pages but is not essential. So that leave us looking forward at? What? We looked at several different curriculum options – printing from online, buying a book at the store, or piecing things together ourselves. We spent a couple of hours with the girls at the store going through things and came home with a company that has been a perfect fit for us – Horizons. Is it a perfect book that makes everything simple? No. But, it fit our needs and has given us a way through our daily math that has made sense and we have seen really fantastic progress. All three of the girls use Horizons Math. The pages are well set up and there is sequential progress through the concepts with a little bit of practice on following days. After a few days of this kind of practice, they might move away from that concept for a while. It will circle back, though, after a couple of weeks and then they will build on it. We have seen the girls confidence and ability soar with Horizons. We know that there are options that may fit better in the future. 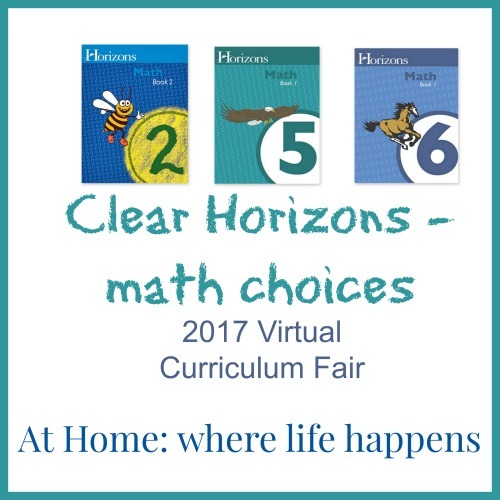 Actually, the near future since Horizons doesn’t have a high school level math option so we will have to find something different. But this? It has been the answer we needed. Pre-algebra is coming up fast. (We may start a review on a Pre-Algebra program in a couple of weeks! I’ll let you know. . .) But until then, we have clear horizons and a program we are pleased with. I say all this to let you know, it is okay to move around a bit to find the right fit. Once we realized what was working or not working about certain programs, our view was much clearer. And with that clearer view, the right fit was easier to find. Need a Fun Book to Read? I absolutely adore Julie Andrews. I have since I was a child and watched The Sound of Music every. single. year. Just ask my brother. He HATED it! But when I discovered her writing, I fell in love with her books, too. My girls love her books, as well. Pink, sparkly, princesses – what’s not to love? Well, because of that adoration, I had to pick up this book at the book sale when I found it. I knew nothing about it but I had to pick it up and read it out loud to the girls. And it is fantastic!!!!!! Three siblings – Ben, Tom, and Lindy – meet the very unusual Professor Savant who becomes convinced that they are just the children who are capable of making the trip to the elusive Whangdoodleland. In order to make the trip and be able to meet the Whangdoodle, the children have to learn to see and understand things in a completely different way than they ever have before. Once they successfully make the trip, they meet amazing creatures and see unbelievable things. Can they find the perseverance and strength needed to meet the Whangdoodle? And what happens if they succeed? There is so many tidbits of wisdom tucked into sentences throughout this book. I couldn’t believe how much was packed into this fantastical, imaginative book about seeing things you cannot even imagine. From the way blood works in a body to how we listen to Latin words to the responsibilities we have of managing life, there are wise thoughts everywhere. One of my favorite scenes was when the professor was teaching the children to look. No, not just look, but to really see, to observe. They were looking at chrysanthemums and the children dismissed them fairly simply but when they actually looked, they saw so much more – color and texture and life. It was really an interesting scene. We loved the book and highly recommend it. Each day, all three girls were disappointed when I placed the bookmark. That is the sign of a very good book. We truly enjoy these products. Each of these we are either still using or have completed. We would recommend these products to our friends to use (and have often with some of these). When people ask for ideas for curriculum, these are the companies we share. All three of the giggly girls had input with choosing these companies. 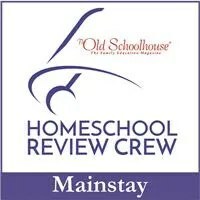 And later this week the results of the Homeschool Review Crew will be posting. I’ll let you know when those post so you can read about what the final results were across the board, including categories that are not included here because we didn’t review in that category OR we didn’t care for the product that we did review. Be sure to check out the Homeschool Review Crew post with all the winners from the Crew voting and other families’ favorites. When that post goes live, I’ll put the link here. Thank your for joining us for our Middle School Monday post and seeing what our favorites were with this year’s Homeschool Review Crew.